A home swimming pool offers a wonderful setting for relaxing and playing in the Arizona sun. But unless safeguards are in place to help keep your child or loved one living with a disability from falling into the water, the pool that lets you relax can make it hard to have peace of mind. A pool safety fence and swimming pool cover from A Safe Pool help ensure that your pool is the site of personal relaxation and family bonding, not preventable water accidents. We also supply leaf pool covers that help keep water free of windblown debris and assist with reducing the need to skim the pool frequently. A Safe Pool doesn’t believe in using scare tactics to promote our products, but we think you should know the facts behind what makes our pool safety fence and swimming pool cover solutions so valuable for protecting children. According to the Consumer Product Safety Commission (CPSC), 350 children age five and under drown in swimming pools each year nationwide, with most of the incidents occurring in June, July, and August, in backyard pools. In addition to primarily occurring in residential swimming pools during summer, these sudden tragedies share another commonality: the homeowner never anticipates that they will happen. Preventing them from occurring can be as simple as implementing one of our removable safety fences, safety nets, or safety covers that help keep children from entering the water. There are several reasons to choose A Safe Pool over other local options. As a family-owned and operated business, we proudly serve our extended neighbors in the greater Phoenix area with a professional commitment to workmanship and a personal understanding of their needs. We also help you get the best product for the best price by beating any competitor’s written price estimate by 10%. 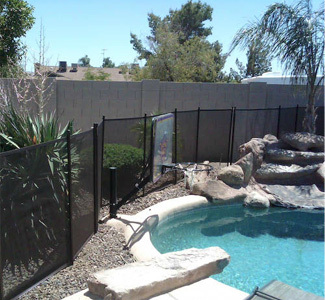 Product choice is an additional plus: we offer various colors and heights of pool safety fence, with custom configurations available for the needs of your setting. We also offer a lifetime warranty on our pool fences and 5 years on our safety nets! A Safe products are superior in both looks and longevity. 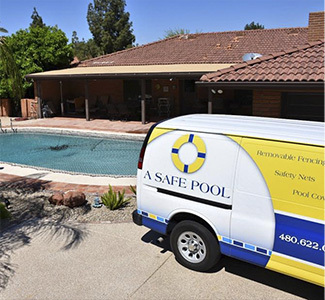 When you choose A Safe Pool, you work with a business that is as professional at what we do, as we are passionate about why we do it. Our customers receive products that compliment the appearance of their pool setting, are competitively priced and built to last, are installed on schedule, and provide a higher level of protection against preventable swimming pool accidents. We also offer leaf pool covers that keep your pool free of fallen foliage. To schedule an inspection of your pool and receive a free estimate, please contact us today. I want to personally thank you for your excellent service. Your crew showed up on time, the fence was exactly how you said it would be, and they even cleaned up after themselves! Thank you very much! Jason, thank you for taking the time to sit down with us and go over all of our questions and concerns regarding the safety of our pool. We felt like you really understood how important it was not to just sell us a fence but to make sure our kids were protected. I have peace of mind knowing that my two girls can play out in our backyard and be safe from the pool. The fence is also very easy to remove and easy to operate. Very satisfied customer! Everybody claims to have a lifetime warranty, but you actually stood by yours! Thank you for handling my warranty issue quickly and without question. The installation crew at A Safe Pool was amazing! They were on time, and installed our net and fence correctly! The fence and the net look amazing! Top Notch company! 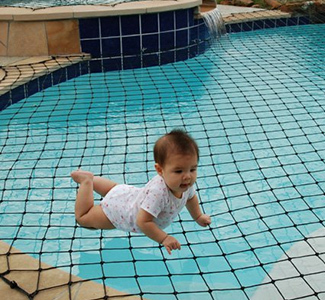 I will recommend A Safe Pool for any safety barrier need! We have used them three times now and each time we have been completely satisfied with every aspect of the company. Great products, great prices, and friendly staff who really care about your needs!